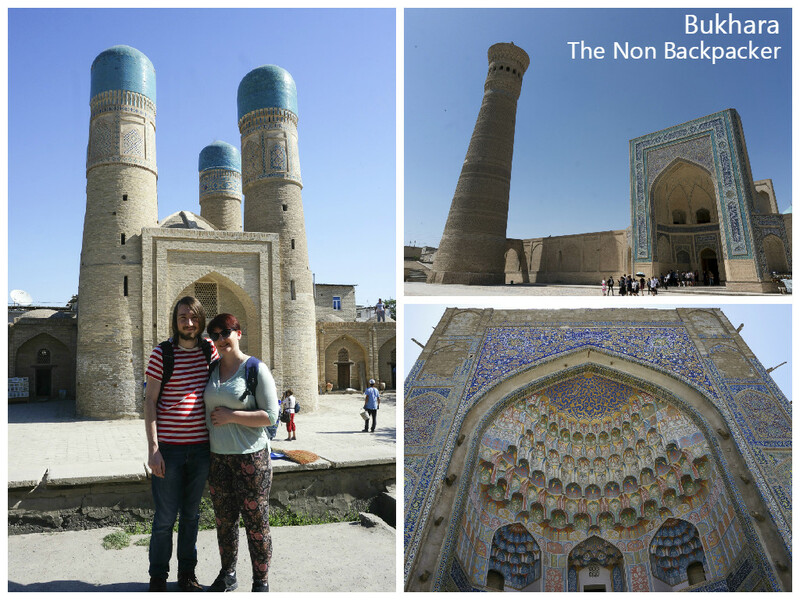 Day Two in Bukhara, the sun was out again and it was fast becoming our favourite city in Uzbekistan. After a quick breakfast and a coffee (and some attempts to connect to WIFI) we headed off to our first site of the day. The Chor Minor or Four Minarets was a gatehouse to a Madrassah, it was built in the 19th Century and nothing but the gatehouse remains. It was an intriguing site as it was so different to what we had seen before. The four towers had been restored at different times and the dates were etched into the domes. We had a little wander around and took some pictures (along with several others groups) and headed off for site number two. 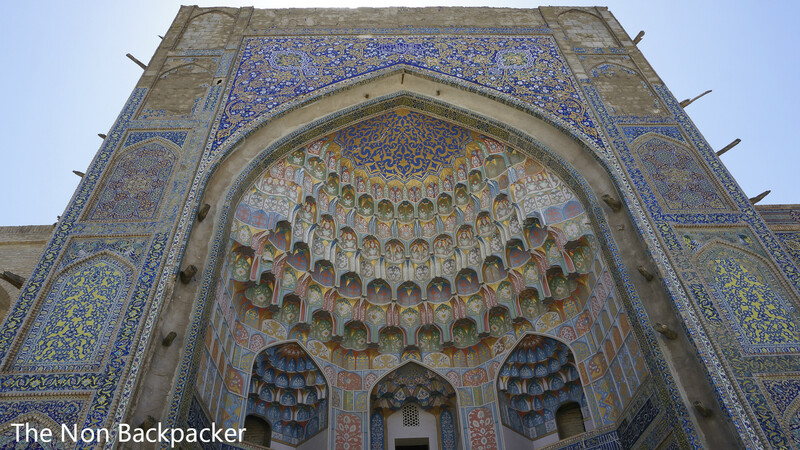 We jumped in the bus and headed to a popular tourist/holy site, Bakhauddin Nakhshbani Ensemble. This site consisted of many crypts, mosques and a lucky tree. The site is the burial place of one of Sufi Muslims founders, Bakhauddin Nakhshbani, you could tell straight away that it was an important site at there were many people praying and the whole site was quite peaceful. We walked through and came up to a pond where there was a huge group of people in one corner. Our guide explained to us that this was considered a lucky tree and you had to walk around and under it 7 times for good luck. 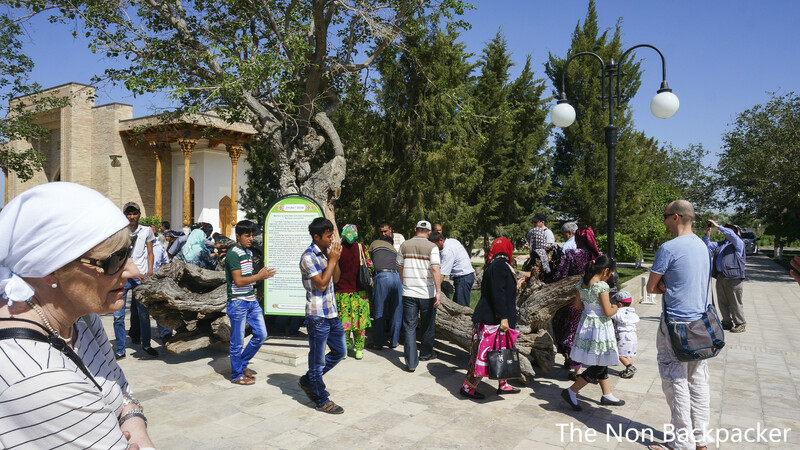 We couldn’t quite understand this as it did seem to go against the core values of Islam but many many people were making the trip around the tree. 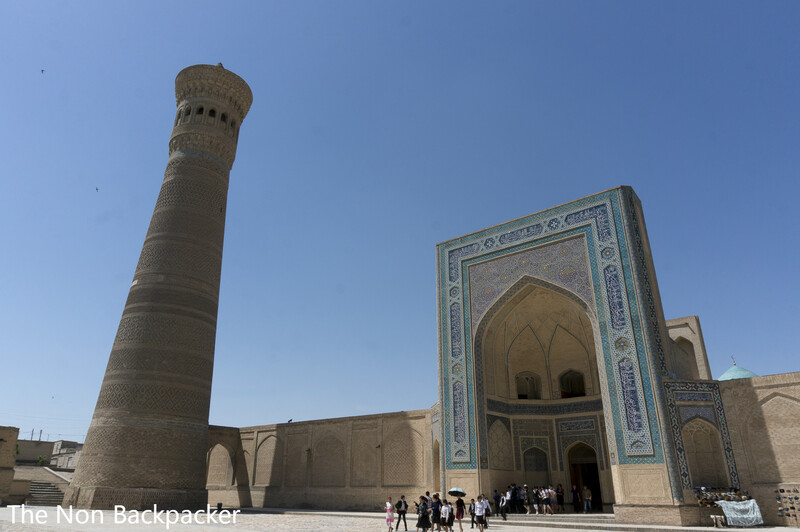 We bumped into a group of lovely men on our way back to the entrance who spoke to us about how they wanted there to be world peace and that they were so pleased to see English travellers in Uzbekistan. For some reason I neglected to get a picture of them!! 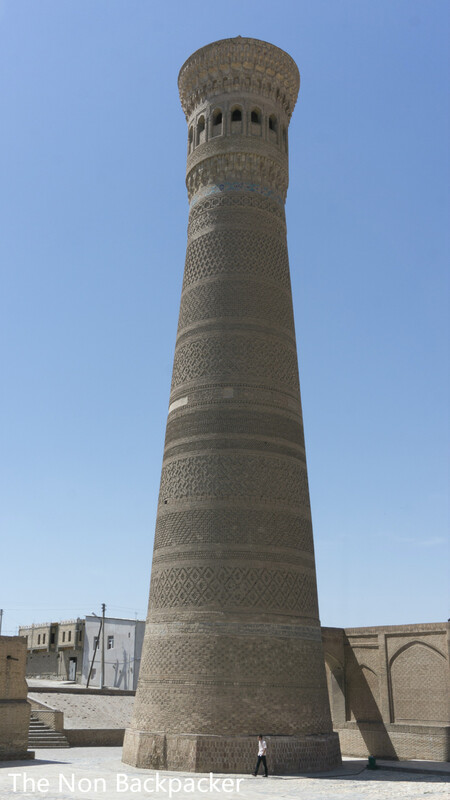 Site number three was the Kalon Great Mosque and the Kalon Minaret. It was very very hot by this point but it seemed to make the building more beautiful in the dusty browns and turquoise blues. 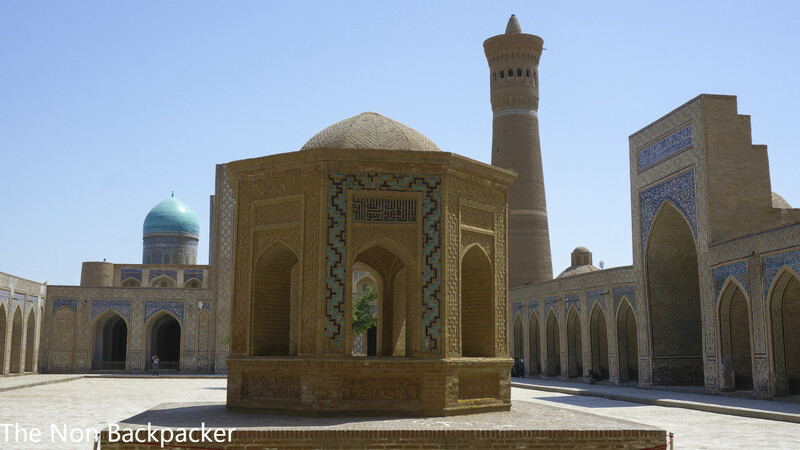 The Mosque is equal in size to the Bibi Khanym Mosque in Samarkand but you could tell the styles were very different. Genghis Kahn burnt the Mosque down and for a long time it was left to ruins, it has now been restored and there is a shrine to the children killed by Genghis Kahn in the courtyard. 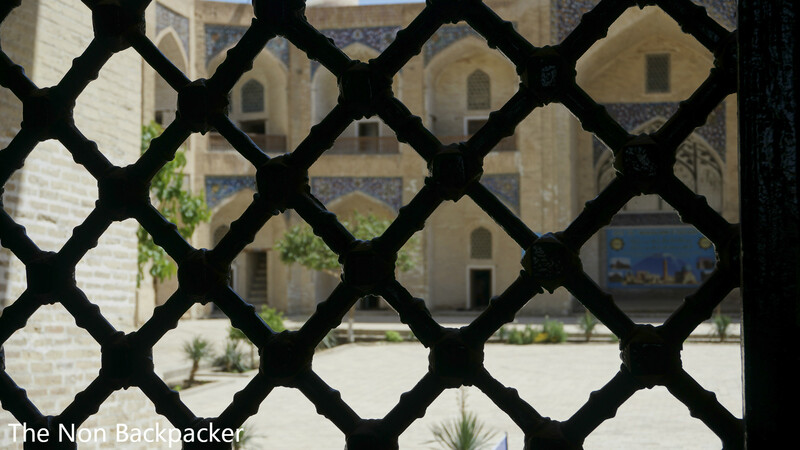 Opposite the Mosque is a working Madrassah, we could only enter the entrance hall as the rest of the building was in use but it was interesting to see one still being used – even if there was a ping pong table in the courtyard! 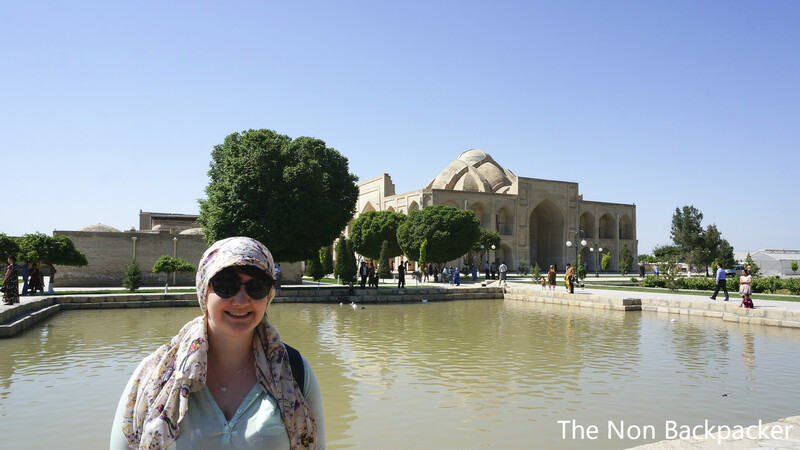 After lunch (Stuart’s favourite beef parcels – the one meal he would have liked a bigger portion of) we headed back to the Lyabi Hauz area to have a look in another Madrassah which had an exhibit on ceramics and then the statue of Nasruddin. Nasruddin was a 13th Century Sufi Muslim who was born in Bukhara and was philosopher and wise man. He is well known in the Muslim world and people tell stories and tales about him. The statue was of him on a donkey – not overly sure why this was so if you know please let me know. 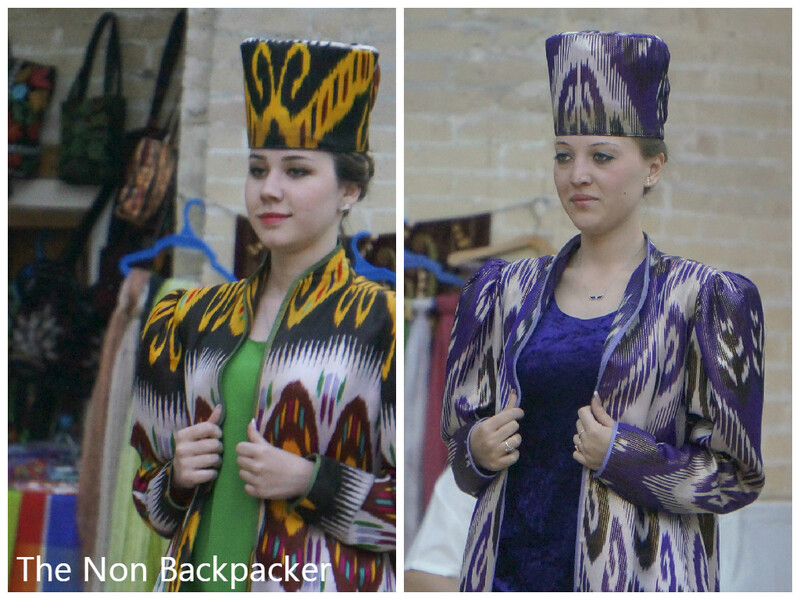 We had some downtime and then headed out for our last night in the wonderful Bukhara – a fashion show! The show was held in (yet another) Madrassah and had some wonderful designs and clothing exhibited. The atmosphere was lovely and people really seemed to be enjoying themselves, it was targeted at tourists but we had fun all the same. 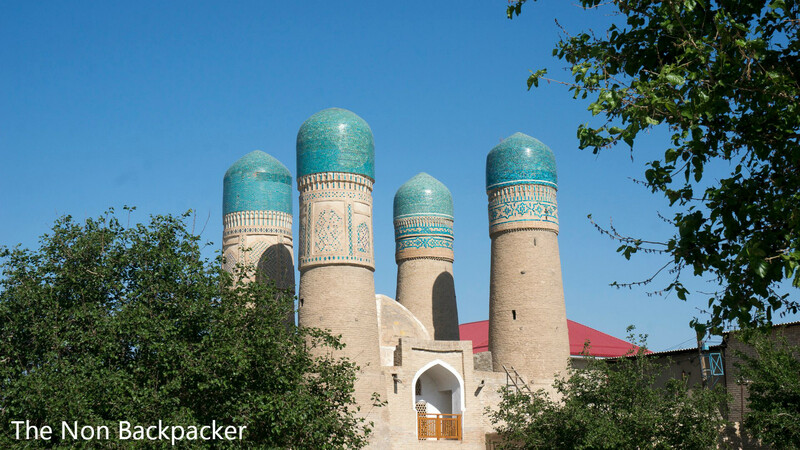 We were a little sad to be leaving Bukhara having had such a nice time – whether that’s due to our wonderful carpet purchase or that the town reminded us of a Chichester of the East. It is definitely somewhere we would like to go back, even just for some more shopping. Where is your favourite place in the world to go shopping?